mexican food is one of those cuisines we can't eat too often - breakfast, lunch or dinner! and we probably take for granted that we live in a town with fantastic authentic mexican food all around us. here's our take on huevos rancheros - it uses a roasted tomatillo sauce instead of pico de gallo or a tomato based salsa. it's nice and mild so add a little heat with your favorite mexican hot sauce or up the amount of jalepeno. preheat oven to 400 degrees F. on a sheet pan, toss garlic, onions, jalepeno, pasillas, and tomatillos with olive oil and salt. roast 25-30 minutes, until soft and slightly brown on the edges. let cool slightly and blend with lime juice, chicken stock, a handful of cilantro, and vinegar. season with salt and pepper to taste. to serve, place a warm tortilla on a plate. 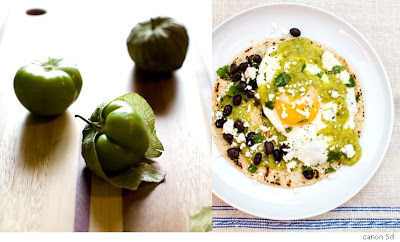 spoon tomatillo sauce on tortilla, sprinkle with black beans, top with a sunny-side up egg and garnish with queso fresco and chopped cilantro. the recipe makes more tomatillo salsa than needed for 4 servings but keeps well in the refrigerator and is good on almost everything!